This is 10 Fun Things to Build With Wood. 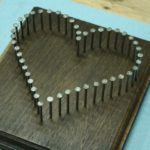 In this post I’ll show you 10 really fun woodworking projects, many with links to learn more about them. By the time you’re done reading, you’ll have a lot of great ideas to take into your shop. Enjoy. Woodworking is such a fun hobby. Even wood itself is an amazing medium to work with for a lot of different reasons. The material is easy to manipulate, inexpensive, and the tools you use are very common. Of all the different projects you can make though, the fun stuff is where the real enjoyment comes from. Sure, there’s fun making utility items sometimes, but it’s a lot more fun to make a wizard wand or a musical instrument. This is the fun side was working, and where I make the majority of my projects. Not that I don’t enjoy a good book case, it just doesn’t have the same ring as wooden signs, wooden rings, or photo prop frames. Here are the 10 different projects that I’m going to cover in detail further down. 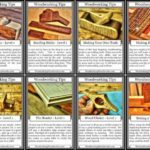 Each one of them is a lot of fun to build, and you will enjoy making any of these woodworking projects. One of the most fun projects that you can make in your shop and build from wood are wooden signs. These are awesome for a lot of reasons, and you can use them to enhance your own decor or sell to others for their own homes. Wood signs can be made in any shape, and any size. They can match with any look, and they can have a number of different things printed on the face. You can create your own custom line of signs, or you can mimic existing styles. 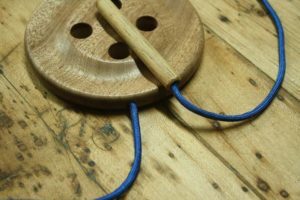 Once you have the small amount of equipment that it takes to get started, this is a really fun project to build with wood that you will enjoy going back to you very often. It makes a great gift too, and you can really make somebody happy with a wooden sign. If you want to get into sign making, then I recommend a Silhouette Cameo cutting machine which is the easiest way to make completely custom lettering. Rings are another fun project to build. As a woodworker, you end up with a lot of scraps from different species that you work with over time. The small scraps can seem worthless at first, but if you make rings they are very valuable. 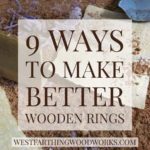 Making wooden rings just involves small pieces of wood that you glue together to form different laminations. 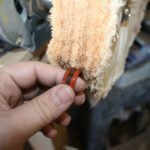 On the edge, these laminations all have a different look, and that is how you design your rings. 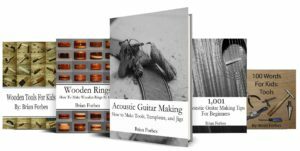 There are a lot of good resources on how to make a wooden ring, including my book, which details the entire process. 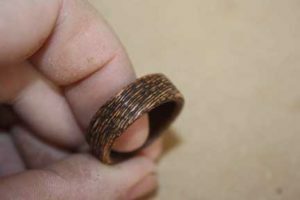 If you have a lot of small scraps and you want to turn them into cash, you may even try making and selling wooden rings. You have not lived until you’ve made something for a child and experience the joy in handing that piece of work over to them. You will never experience gratitude like you do from a small child. It’s one of the hidden treasures in woodworking. Kids toys is a massive topic. You can literally make anything and you can always find a project to make you happy. After it makes you happy, it will then make a child happy, which will in turn make you even happier. If you’re looking to build something that can make a difference in someone’s life, build wooden toys for kids that are less fortunate, or in need. You can also build toys for your own children and grandchildren. One of the greatest gifts that you give a child is the gift of height. While that sounds kind of funny, giving your children access to kitchen counters and workbenches at a more comfortable level can make a big difference in their ability to learn. In a lot of ways, a child has limitations as to what they can do in certain areas of the home due to their height. If you want the child to work with you at the kitchen counter, it’s going to be very hard for them without a boost. 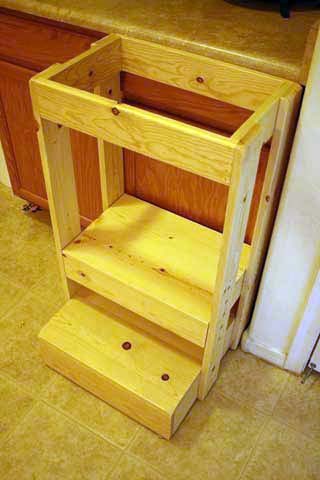 The kitchen helper, or learning tower is an easy project to build with wood, and you can give access to higher places to young children very easily. This gives them the ability to work with their parents at the counter, or work with you in the shop at your bench. 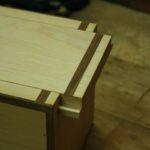 While on the subject of kids, making furniture for kids is also a lot of fun, and you can incorporate the challenge of building furniture with also making a child happy. This is a double win, because you get to make a kid smile and improve your own skills. Kids furniture may look small and cute, but it is no easier to make than furniture for an adult. A chair is still a complex project, no matter how small. 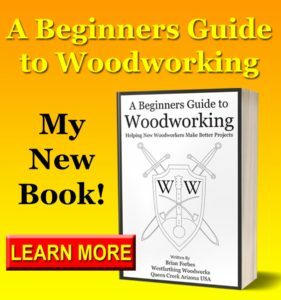 Knowing this, you can improve your woodworking skills and still make a fun project. 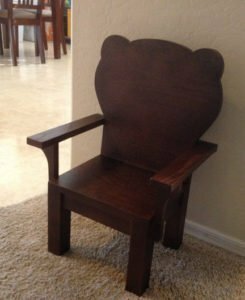 In fact, if you are interested in getting into making chairs, building chairs out of wood for children is a good start. Since the project is smaller, it is a little bit easier to manipulate, but the building techniques are still very important. One of the most fun things you can make is an instrument. The easiest way to start is to look at any instruments that you already play. If you don’t play anything, maybe look to your spouse or a close family member. I play guitar, so the choice was very easy for me. 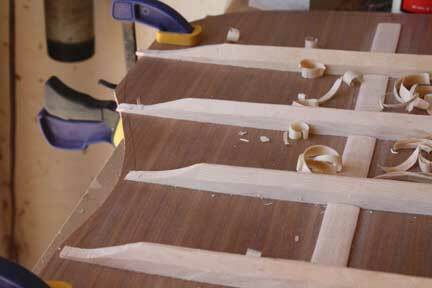 Making acoustic guitars is a fun project, and you can build an entire guitar from wood. The difference between this and any other project is that a guitar makes noise, but the rest is about the same. Don’t shy away from making a musical instrument because you may think that it’s somehow different than any other woodworking project. It’s not. You still have to make things a certain way, and a certain size, and from a certain material. When you have a party, many times people forget to take pictures. 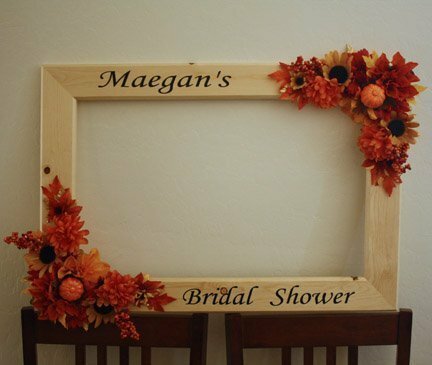 A way to encourage this is to use a photo booth frame that you can make with wood. It’s easy, fast, and you can customize it for any of your get-togethers. A photo frame is just a picture frame where you only make the border and nothing else. You hold it like a prop, and it frames you or your friends for a picture. All you need to do is leave the frame out, and encourage people to take pictures with their phones. On top of that, if you make a plain frame, you can decorated for the occasion. It’s really easy to add lettering, or paint the frame a different color. Now, you’ll have a lot of pictures from every one of your parties to share and remember. Another fun project is cutting boards. 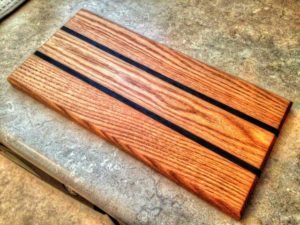 You can build cutting boards with wood very easily, and since you can make them in all kinds of different shapes and styles, the project is a lot of fun and very versatile. The fun thing about a cutting board is the different expressions that you can create. You can use scraps that are long, or short. You can laminate different pieces of wood together in almost any way that you choose. Another fun part besides the design is the economy. Cutting boards can be made from scraps, and that means that most of the time they are free. Scraps are considered free because you already bought the wood for another project, so the excess is a gift. Once you get a hook for making cutting boards, look into making bread boards and cheese boards as well. These are a similar construction style but a little bit different look. They are fun projects and they are easy to build with wood. No aspiring witch or wizard would be complete without a proper wand. 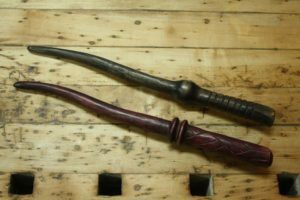 It’s fun to make wands, and you can make them from wood very easily. There are a number of different tutorials online, or you can carve them like in my tutorial. Wands are a lot of fun, and they make a great gift for a young child. I don’t think there’s a child on the planet that hasn’t seen all of the movies and even possibly read all of the books, so wands are extraordinarily popular. You can make wands really easily out of a couple of dollars of wood. You can also make custom wands that you carve out of exotic hardwoods. Use the lathe if you like as well, and you can do a number of different amazing designs. If you are a pipe smoker, or you know a pipe smoker, there is nothing like a fine handmade tobacco pipe. From a professional maker, you can spend hundreds or thousands of dollars on a one-of-a-kind piece of Briar. 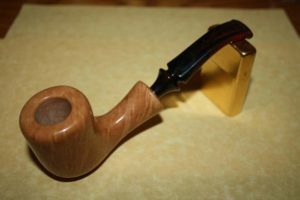 In reality, making a tobacco pipe, at least at the fundamental level is not much different than making other woodworking projects. You build the project from wood just the same, though you need to use Briar in order to get the best effect. When you hand somebody a custom made tobacco pipe, anyone who understands the quality will be immediately floored. A handmade pipe is a thing of beauty, and a fun project to make. 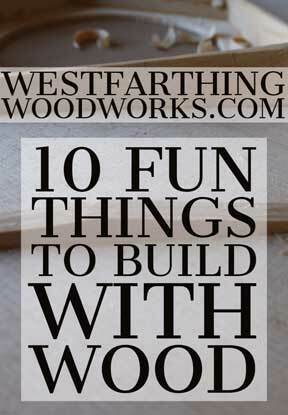 Now that you know 10 different fun project to build with wood, it’s time to take action. Pick one of these that you know you can make, or one that you think will be a little bit of a challenge. Then, get yourself out into the shop and start making some sawdust. Each of these projects is a lot of fun, and it will reward you with something that you can use in the end. This is what I think makes woodworking projects the most fun. When you have something that you can use, or that you can give to someone else to brighten their day. 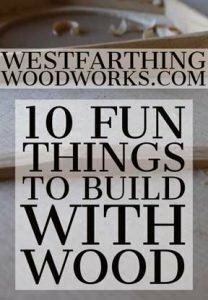 If you have any questions about these 10 cool projects to build from wood, please leave a comment and I’ll be glad to answer them. Happy building.